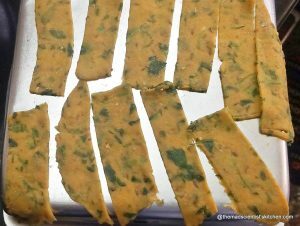 Fresh Methi Crackers Baked ( Baked Methi Mathri) is a healthier baked version of the Indian savoury cracker Methi Mathri. A Mathri is a deep-fried snack that is made from refined flour. However, here I have used whole wheat flour and chickpea flour and baked the mathri. The addition of fenugreek or methi leaves increases the increases the dietary fibre and flavour of the mathri. But then consuming methi has its own benefits like it lowers cholesterol, controls diabetics to name two. This month for BreadBakers we are making Crackers that our host for the month, Sue who blogs at Palatable Pastime asked us to bake crackers or crisp lavash of any flavour and with any flour. 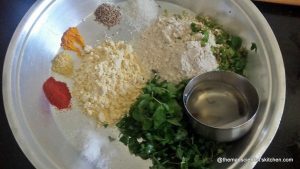 The main ingredients are whole wheat flour, chickpea flour, fresh methi leaves, green chillies, ginger, cumin, red chilli powder, turmeric, sugar and oil. I have adapted the recipe to suit our tastes from here. Preheat oven (OTG) at 150° C.
Crush the green chillies and ginger to a fine paste. 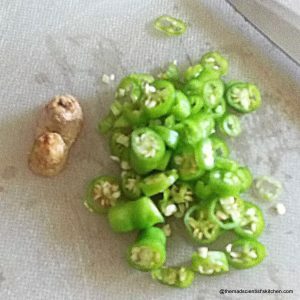 I started out with this chillies but then I reduced the chillies and ginger by half. 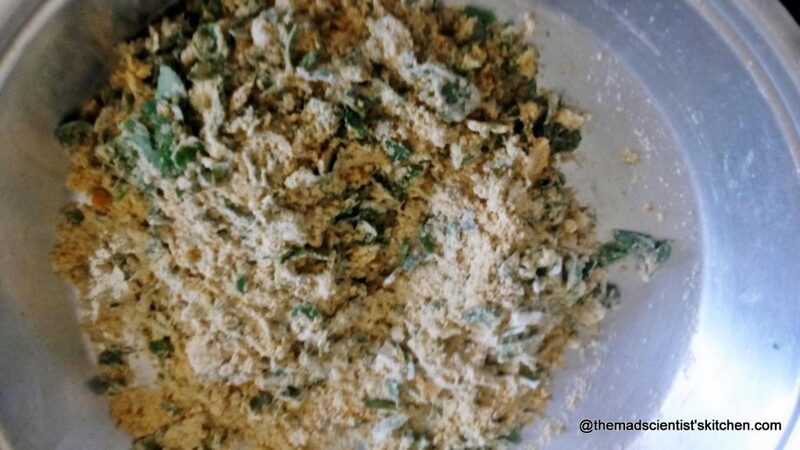 In the parat, add the green chillies, ginger paste, methi leaves. Add the whole wheat flour, besan, salt, sugar, cumin seeds, red chilli powder, haldi, soda. 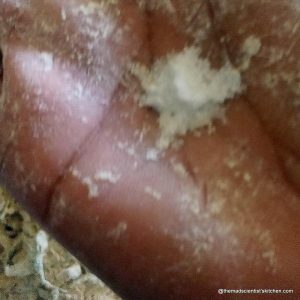 Add the 2 tsp oil and rub the flour until the flour resembles crumbs. Add a little water and knead to a stiff but pliable dough. Apply the rest of the oil to the dough and keep it covered for 30 minutes. Make 4 equal balls with the dough. Roll the dough into a thin circular disc and then cut into desired shapes. Place the strips on a greased baking tray and bake for 20 minutes until crisp and golden. 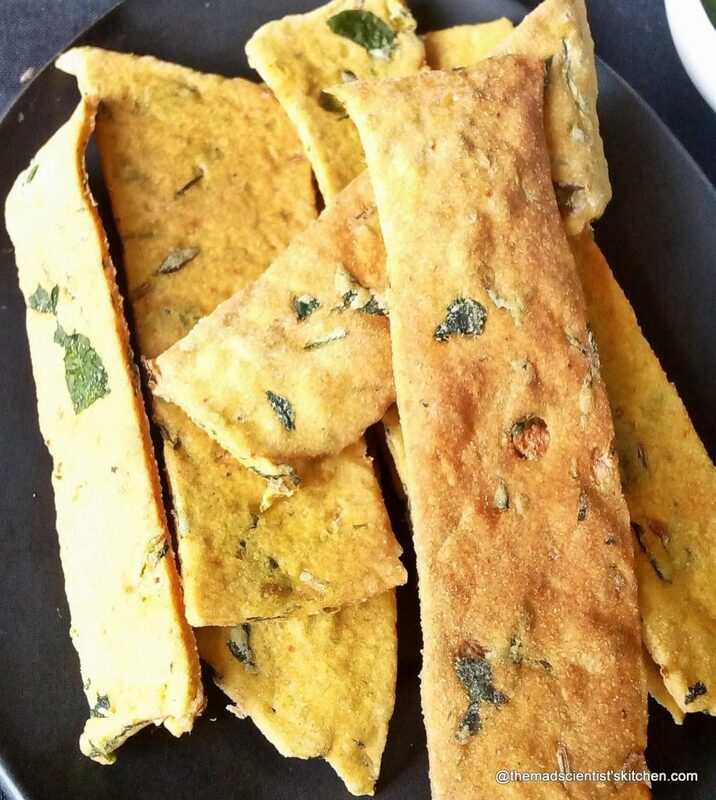 A healthier baked version of the Indian savoury cracker Methi Mathri. Crush the green chillies and ginger to a fine paste. Add the whole wheat flour, besan, salt, sugar, cumin seeds, red chilli powder, haldi, soda. Rub the ingredients together. Roll the dough to a thin circular disc and then cut into desired shapes. Hello Archana, I loved your recipe. I made methi crackers during Holi and used Kasuri methi. We used them for chaat papri and loved it. Your crackers look so beautiful and Yum! Papdi chaat yes that is a great idea. Thanks for the suggestion and your lovely comment. 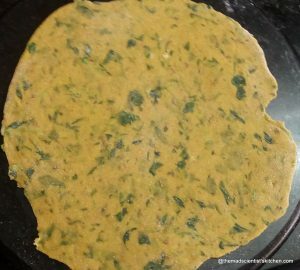 Lovely healthy twist to our good old methi mathri recipe in the avatar of new age baked cracker just loving it???????????????? superb idea to include methi leaves in regular diet, this will be a great pair with a cup of tea..
Woman after my heart!!! It was yummy. 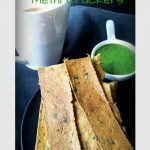 Those methi crackers looks absolutely fabulous to munch anytime of the day Archana, and the addition of methi leaves makes this crackers more healthier. 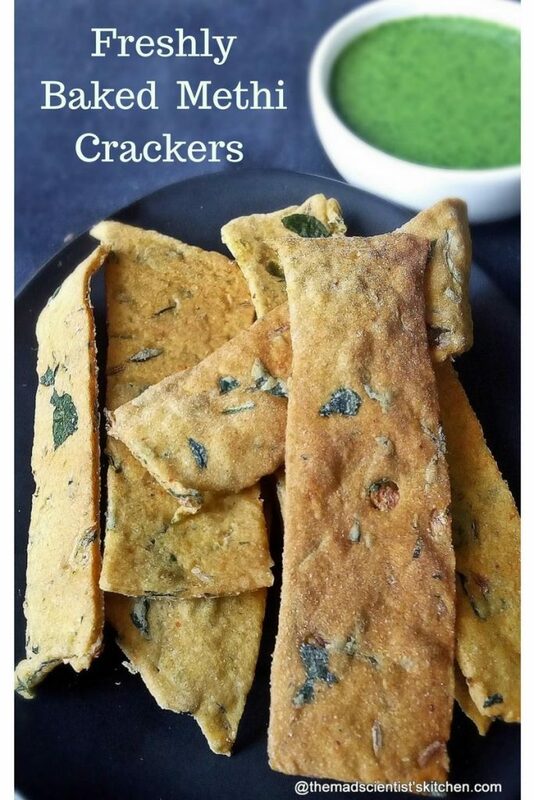 What a treat these Methi crackers are and i like the baked recipe-no guilt! Loved the recipe and I bet these must be so good that it would vanish within minutes with either a dip or a cup of chai! Baking is my passion too, mostly savoury and crackers are such a delight esp with whole wheat, healthy too. Wow.. I am going to make them too. Super duper healthy snack.. Loved the infusion of flavours in these baked crackers, healthy and yummy choice for anytime munching. 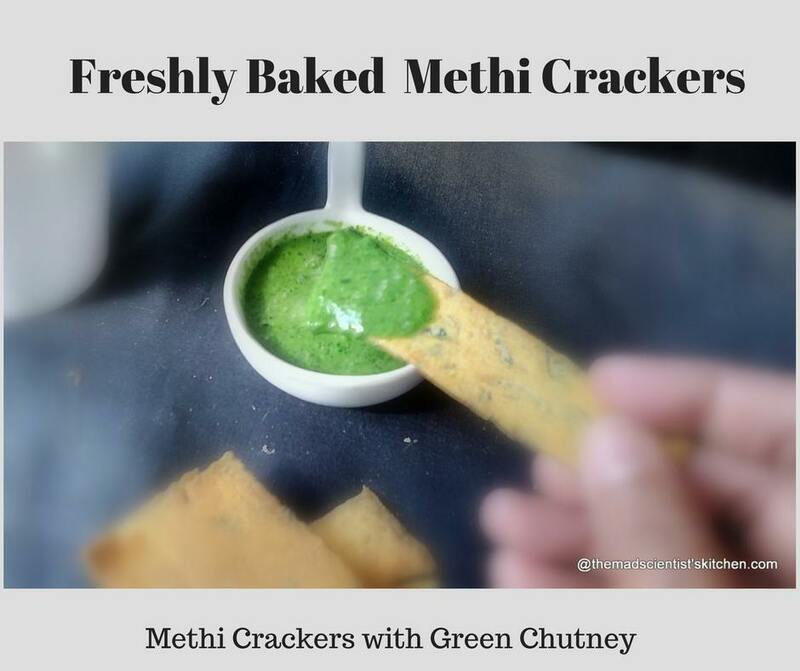 Perfect snack for a road trip…Methi flavour rocks and love the fact that they are baked…guilt free indulgence!! 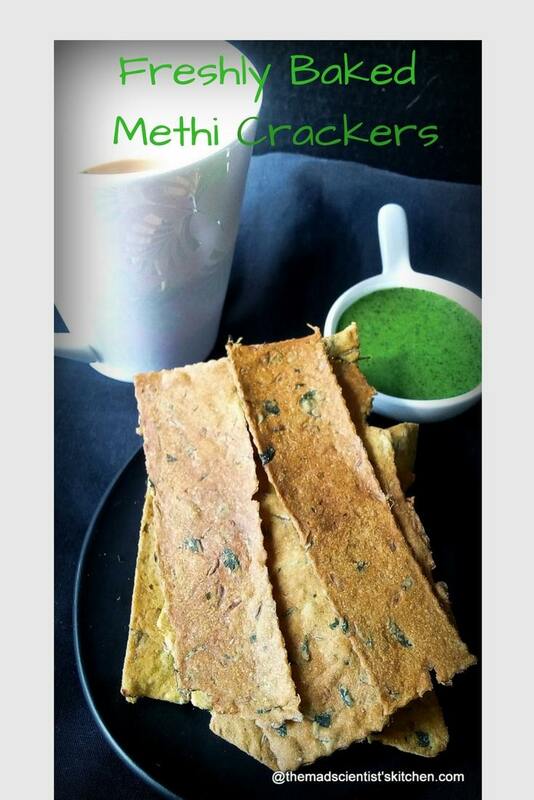 Wow.. methi crackers sound delicious !! Always love such healthy snacks. Will try this for sure. Thanks for sharing !! These mathris post reminded me of my Nani who used to make such awesome mathris. The baked version gets a big thumbs up though here. They are simply mouthwatering tea time snack for me. 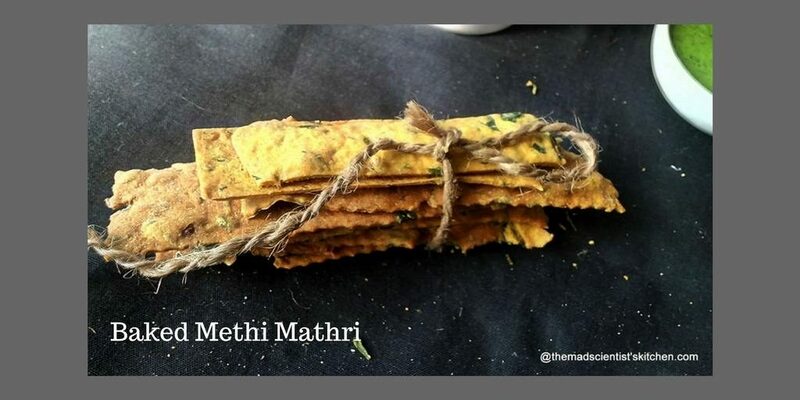 Loved these baked methi crackers. yummy share!! Health and crispy methi crackers.Thanks for sharing the recipe. Wow. Superb recipe. Baked snacks are way better than deep fried one. I am slowly adapting to this. These crackers are perfect for an evening snack. Healthy and delicious. Loved these baked crackers, they look so yumm. I need to try sometime. Lovely share. 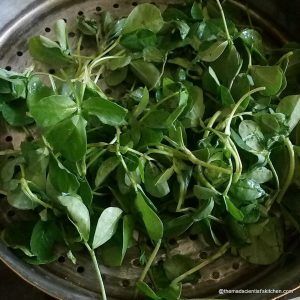 A nice twist and interesting way to incorporate methi to everyone’s diet. Bookmarking this. Methi crackers are favourite tea time snack at my place. But i make them with kasuri methi as we get fresh fenugreek only during winters here in Mohali. Will try your version when fresh fenugreek leaves are handy. Ritu I think I will be coming to your place just to eat these crackers and your awesome cakes and malpuas. 😀 Do share your pictures with me and of course the tweaks. Who can deny to these healthy baked goodies 😉 Awesome way of making the mathris !! !